Capital S.M.A.R.T held its fifth annual conference for its leadership group in Sydney, with 115 team members from around Australia and New Zealand taking part. 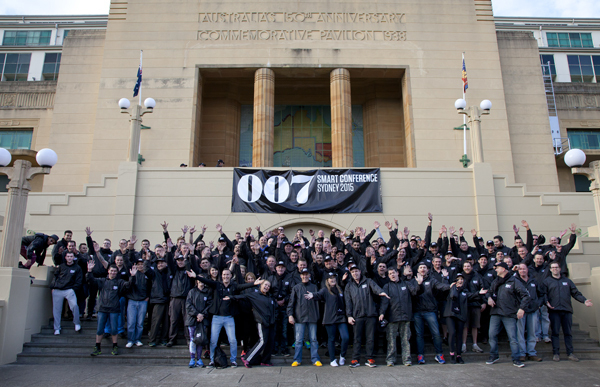 The theme of the event was “007”, referencing the business heading into its seventh year of operation. Chief Operating Officer and Chief Finance Officer Evan Camilleri lead the conference, with Group Operations Director and Founder, Jim Vais, the main presenter outlining the future for the business and where it is heading. New Chief Executive Officer, Alex Milan, introduced himself to the S.M.A.R.T team and talked about “What Makes Me Tick”. Innovation has always been part of S.M.A.R.T’s DNA and Chief Technology Officer, Andy Baker, showcased the next generation of Key2Key™ Technology which has been crucial in driving Customer Satisfaction. S.M.A.R.T’s industry leadership has again been recognised with the Australian Business Awards Employer of Choice Award announced at the conference. It is the fourth ABA award for S.M.A.R.T. Team events are a feature of the annual conference and this year twelve teams were challenged to produce their own videos, all of which were shown at the 007 Gala Dinner in the IVY Ballroom. The event was held at Fox Studios, where movies such as Great Gatsby, Mad Max, and Moulin Rouge were filmed along with TV series such as Love Child and the Voice.